Like many men I used to swap and change my skincare products, or worse…I occasionally use none at all! Now thanks to Lisa Franklin London that’s all changed. It started with a signature facial with Lisa at her Clinic Prive on Sloane Street London, where Lisa combined traditional techniques with state of the art products. My results were so great so I felt the need to carry on her good work at home… with an easy and effective skin care routine! Fast forward a few weeks and now I have a skincare regimen that works, and the benefits to my skin are obvious. My skin may be pretty resilient but as a city dweller the environment I live in (with its ever present pollutants) was leaving me decidedly dull and lack lustre. Now after regular use of her Pro-Effect Skincare for Men I’m shining far brighter in 2019. The daily use of just three pint sized power products has been enough to turn my skin around. The start of my day has also transformed! Now when I stumble bleary eyed into the bathroom, the first thing that I do is reach for a few drops of Lisas ‘Men’s Refining Scrub’ a rich micro exfoliant gel that brightens the skin. I follow that with ‘Men’s Gel Wash’ which leaves my skin feeling supple and refreshed, the final crucial touch is some all important ‘Pollution Defence Cream’. It has prebiotics which increase healthy bacteria to preserve and balance the skin’s protective ecosystem by stimulating its natural defences. What’s more all these intelligent products are cruelty free, nutrient and mineral rich, and packed with powerful plant and fruit extracts. They leave my skin feeling relaxed and hydrated with no tightness or irritation and also excess sebum is controlled. Above all my skin just looks and feels healthier and brighter. Thanks Lisa Franklin London..I’m hooked! Men’s Refining Scrub: £38 for 50ml. Men’s Gel Wash: £32 for 50ml. 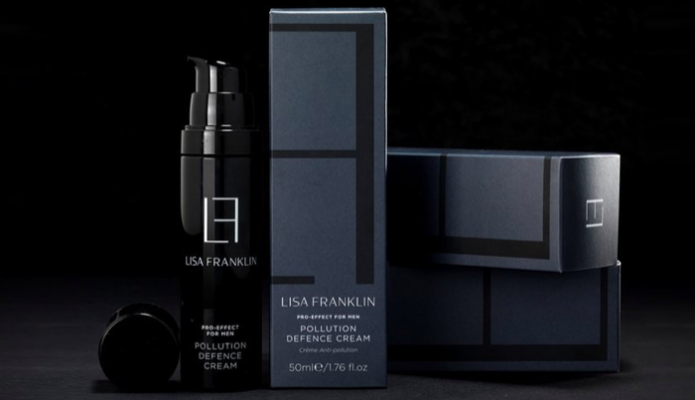 Pollution Defence Cream £80 for 50ml.